PATNA: The protest against reservation is turning serious in Bihar. 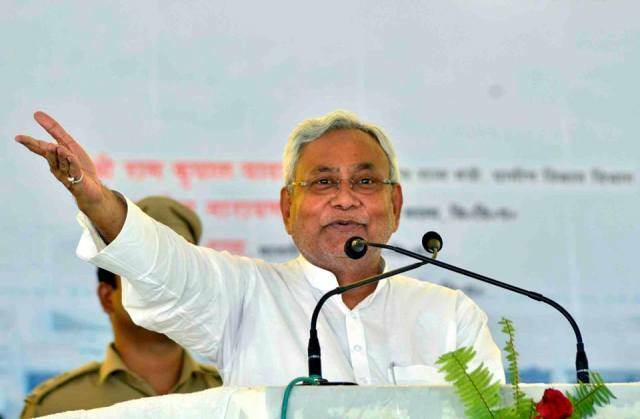 Today a youth from upper caste community threw slipper at chief minister Nitish Kumar to express his anger although the object didn’t reach near him and landed among the crowd. The chief minister had reached the dais to address a meeting of the party’s student wing leaders when the youth hurled his slipper targeting him. Instantly, the party leaders rushed to him and gave him a severe beating before the police could rescue and arrest him. The arrested youth has been identified as Chandan Kumar Tiwari, a resident of Aurangabad district. He is said to be working for Swarn Sena, an organization of upper castes. “I registered my protest against the discriminatory reservation policy which helps even the better off among the Scheduled Castes, Scheduled Tribes and Other Backward Castes even as the poorest of the poor among the Dalits have been left to fend for themselves,” he was quoted as telling the police by news18.com. The Swarn Sena has been angrily protesting in Bihar for the past two months, seeking reservation for poor among upper castes and ending the controversial provisions in the Scheduled Castes and Scheduled Tribes (Prevention of Atrocities) Act.